My Sweet Little Princess Bowtique: Pettiskirts! Borrowed photo, I will take my own photo during the weekends. 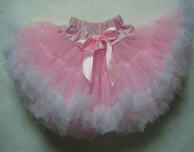 The pettiskirts have large ribbon bow attached to the front of the skirt. These are 3-layered and fluffy , not transparent.